Free Shipping Included! 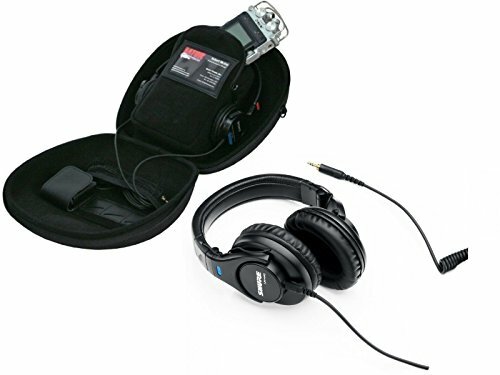 Shure SRH440 Professional Monitor Headphones with Gator Recorder Case for Recorders, Headphones and Accessories by Shure at Right Clearing. MPN: SRH440. Hurry! Limited time offer. Offer valid only while supplies last. The SRH440 around-ear headphones from Shure provide high-quality audio ideal for professional applications, such as studio monitoring or DJ mixing. The SRH440 around-ear headphones from Shure provide high-quality audio ideal for professional applications, such as studio monitoring or DJ mixing. The headphones have large drivers that provide clear, detailed audio with a wide frequency response. The closed-back design helps to reduce ambient noise while the swivel earcups provide easy single-ear monitoring. The headphones can also fold down for easy storage in the included carrying bag. The thick around-ear cushions provide long-lasting comfort and are easily replaced. The adjustable headband is generously padded and can fit virtually any head size. The coiled, single-sided cable provides a variable amount of slack and is resistant to tangles. It can also be detached for easy replacement, and has a bayonet clip to keep it securely attached to the earcup. The gold-plated 3.5mm mini plug and 1/4" adapter provide wide compatibility with MP3 players, CD players, computers, and more.